Snow in NYC is pretty or whatever, but we’re desperate to hang onto summer any way we can. A new holiday pop-up (yes, another one) named Beach on Bowery is arriving in NYC this week, and one of its prime offerings is a twist on your favorite ice cream cones. 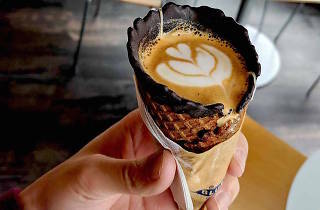 The brand-new coffee cones come courtesy of Bluestone Lane Coffee. 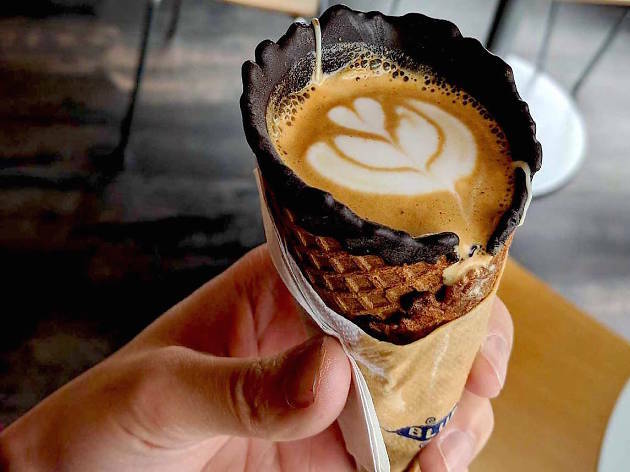 The cross between a breakfast beverage and dessert is served in waffle cones, which come coated in chocolate. Next, they're filled with espresso coffee and completed with latte art, the better to Instagram. We heard a rumor hot chocolate cones might be available as well. Snap a photo fast, because you’ll need to drink it within 10 minutes to avoid a literal meltdown. We recommend sipping all the coffee first, then chowing down on the cone. You will likely wind up with a sugar rush and chocolate all over your face, but it's worth it. Beach on Bowery will be open from December 14 to 17, and you can find it at 319 Bowery. If you miss it there, on December 18 you can get the treats at Bluestone Lane’s West Village location at 30 Carmine Street—but only from 10am to 4pm while supplies last, so hurry!